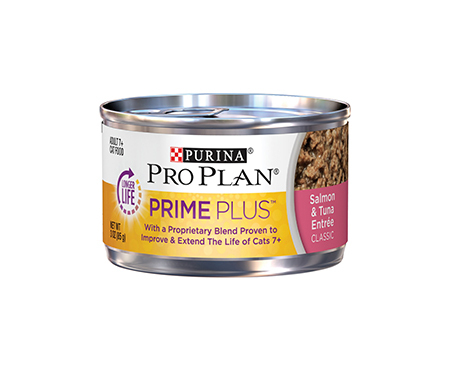 A cat’s body starts to change around the age of 7, so Purina Pro Plan Prime Plus Adult 7+ Salmon & Tuna Entree Classic Canned Cat Food was specially created to meet their needs. Backed by an extensive, nine-year study, this diet has been proven to actually improve and extend their life. It uses a special blend of nutrients to support a strong immune system, and it also helps to maintain lean body mass and a healthy weight—a crucial component for their overall health. Improved microflora support a balanced digestive system, and with real salmon as the number one ingredient, it’s total nutrition that they’ll enjoy down to the bottom of the bowl. Made in the USA with real salmon as the first ingredient for tasty flavor, in a pate form.